Anna Mae Winburn (née Darden; 13 August 1913 – 30 September 1999) was an influential American vocalist and jazz bandleader who flourished beginning in the mid-1930s. She, herself, African American, is best known for having directed the International Sweethearts of Rhythm, an all-female big band that was perhaps one of the few – and one of the most – racially integrated dance-bands of the swing era. Her first known publicized performance was singing with the studio band of Radio WOWO, Fort Wayne. She worked at various clubs in Indiana, including the Chateau Lido[i] in Indianapolis (where she appeared under the pseudonym Anita Door). From there she moved to North Omaha, Nebraska, where she sang and played guitar for a variety of territory bands, or groups whose touring activities and popularity were geographically limited to several adjoining states, that were led by Red Perkins. During that time Winburn was a collaborator of Lloyd Hunter, frequently singing for Lloyd Hunter's "Serenaders". She also led the Cotton Club Boys out of Omaha, a group that at one point included the amazing guitarist Charlie Christian. 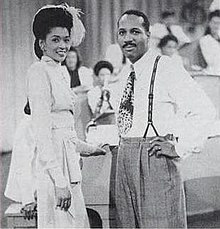 When many of the musicians were lost to the World War II draft, Winburn joined the International Sweethearts of Rhythm. Soon she went to Oklahoma City and led bands for a short while. It was there that she led Eddie Durham's "All-Girl Orchestra", which eventually earned her an invite to join the International Sweethearts of Rhythm. Eddie Durham had been the composer for the International Sweethearts of Rhythm for two years before leaving to join Count Basie's band. After being recommended by Jimmie Jewel, who owned North Omaha's Dreamland Ballroom, Winburn became the leader of the band in 1941. She was reportedly hired for her attractive figure, with the intention of doing little actual composing or singing. In a video interview from 1986, Winburn reported of her first meeting, "I said 'What a bunch of cute little girls, but I don't know whether I could get along with that many women or not." Despite rumors of Betty Carter being groomed to take her place after her marriage, Winburn was the leader of the band until it folded in late 1949. Winburn formed other incarnations of the International Sweethearts for the next 10 years, often billing her name before the band's. However, those bands never regained the notoriety of the early years. 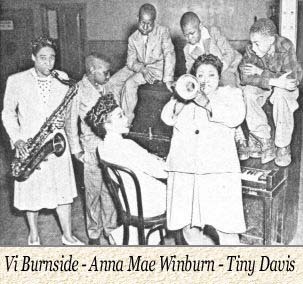 Anna Mae Winburn was born in Port Royal, Tennessee, to Andrew Jackson Darden (1881–1956) and Lula Carnell (maiden; 1882–1929), a musical family. Her family moved to Kokomo, Indiana, when she was young. On January 2, 1930, Anna Mae Darden married Charles Winburn (né Charles Raymond Winburn; 1910–1960) in Howard County, Indiana. In 1947, Anna Mae Winburn was granted a divorce by the Howard County Circuit Court in Kokomo. In the divorce proceedings, she testified that Charles abandoned her in June 1934. Around 1948, Winburn married "Duke" Pilgrim (né Eustace Michael Pilgrim; 1921–1970) around 1948. They had four children. They lived in Elmhurst, New York, among many Harlem transplants and jazz greats. Duke Pilgrim, before marrying Anna Mae, had been divorced from Albertha Adams (maiden; 1910–2005), a dancer whom he married April 27, 1940, in Manhattan. Mattie, Judy, and Easter were also performers. Judy sang with groups around Minneapolis. She was married to Frank Perkins (né Frank Shelton Perkins, Jr.; 1915–1985), a pianist and son of Red Perkins. 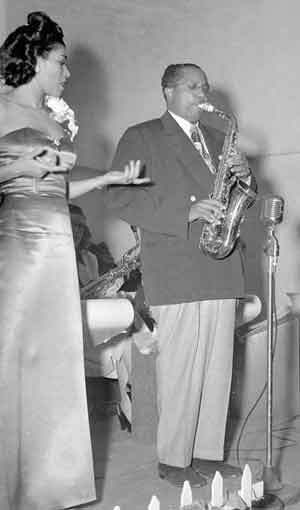 Sometime around 1961 Judy married saxophonist and bandleader Percy Caesar Hughes (1922–2015) of Minneapolis. Judy, then known as Julia Mae Hughes, died of lung cancer on January 1, 1975. Easter married drummer and vibist "Jeep" Stewart (né William Alfred Stewart; born around 1920), and after divorcing him, later married James Elias Overton (1922–1986). Easter has been twice married before, first, in 1936, to Samuel L. Thurman, and second, in 1943, to Ulysses Grant Waldon, Jr. (1912–1978). Winburn died in September 30, 1999, in Hempstead, New York. ^ Chateau Lido of Indianapolis was a private house converted into a club at 4424 Keystone Avenue at Allisonville Road. It ran from 1933 to 1935. Later, in the 1940s, the venue became the "Southern Mansion" and featured big bands. Chateau Lido was managed and owned by Robert C. Criswell (1916–1991) and his wife, Venita Viola MacMillan (maiden; 1917–2016) and Floyd J.B. McKinsey (1893–1942). ^ Daniels, Douglas Henry (2006), p. 194. ^ (nd) International Sweethearts. MusicWeb Encyclopedia. Retrieved 7/8/07. ^ (nd) "The International Sweethearts of Rhythm". City of Charlottesville. Retrieved 7/8/07. ^ Placksin, Sally (1982), American Women in Jazz: 1900 to the Present : Their Words, Lives, and Music, Seaview Books, p. 108. ^ Hickok, G. V. and Barnhart, T. (1990), A Celebration of Women in the Arts: The Best Selections. Helicon Nine Editions, University of Michigan, p. 332. ^ Handy, D. A. (1998), Black Women in American Bands and Orchestras, Scarecrow Press, p. 63. ^ Feather, L. (1987), Jazz Years: Earwitness to an Era, Da Capo Press, p. 137. ^ (1986) International Sweethearts of Rhythm. Schiller and Weiss. Swing Time Productions. ^ Bauer, W. R. (2002), Open the Door: The Life and Music of Betty Carter, University of Michigan Press, p. 21. ^ Hine, D. C. (2005), Black Women in America, Oxford University Press, p. 132. ^ Daniels, Douglas Henry, One O'clock Jump: The Unforgettable History Of The Oklahoma City Blue Devils. Beacon Press (2006), p. 197. ^ Minnesota Death Certificate Index for Anna's sister, Julia M. Hughes. ^ McPartland, M. (2003), Marian McPartland's Jazz World: All in Good Time, University of Illinois Press, p. 142. ^ Verbal recollection of Stewart "Dirk" Fischer, given to the contributor of this article via email, October 28, 2007. In 1948-49, Judy Perkins was divorced, according to Mr. Fischer, who knew them personally. ^ Percy Caesar Hughes, Jr. Archived September 8, 2003, at the Wayback Machine. USTA.com. Retrieved 5/5/08. This page was last edited on 20 March 2019, at 00:17 (UTC).